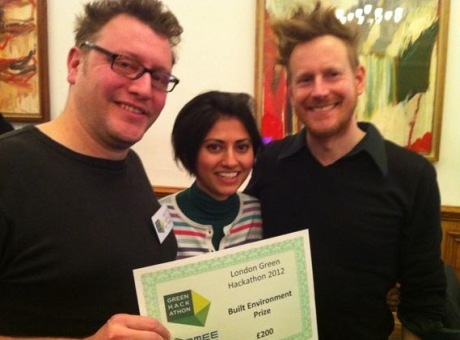 Tia Kansara, PhD student at the UCL Energy Institute, received the Built Environment Prize at the London Green Hackathon last weekend. At the event, hosted by UCL, Tia Kansara converted the urban data that she had of buildings in Dubai and converted the building into blocks of CO2e and Energy. Tia was joined by Gary Hill and Adam Nieman, her two team mates from Carbon Visuals, who coded Tia’s data into a format that could then be viewed on Google Earth, showing building footprint, energy consumption and CO2e footprint. Tia now plans to develop new methods to create more fun and interactive ways to collect and visualise building evaluation.